Each year the MEF awards thousands of dollars in grant money to the Mercer School staff for creative projects or equipment needed for the classrooms that are not able to be funded through the current school budget. Each applicant must submit a detailed application about the project and its positive impact on the students. The application is reviewed and voted on by a committee. Some of the funded projects include sponsoring an Iron County Nordic ski team, and outdoor educational opportunities, such as animal tracking and snowshoeing. Also, students in elementary and secondary classes have been able to attend theatrical performances, such as Of Mice and Men, To Kill a Mockingbird, and The Nutcracker. Funds have also been provided to purchase Smart Boards for classrooms and to enhance a courtyard garden. Thanks to a grant from the MEF, the Mercer School's first-third grade students have enjoyed participating in winter outdoor activities at the Carol Hanneman School Forest. Each classroom was awarded ten sets of snowshoes, several trade books related to animal tracking and wildlife observation, and supplies for completing related art and language projects. 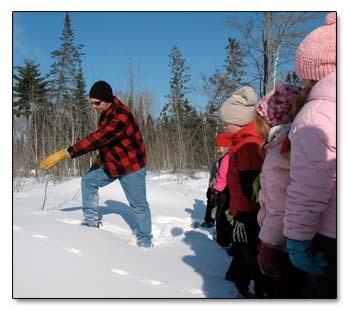 On January 28, 2009, students were led by wildlife biologist Bruce Bacon (Mercer D.N.R) and wildlife technician John Nuce (USDA. A.P.H.I.S) on interpretive tours along the two developed trails in the school forest. They were thrilled to find signs of rabbits, deer, and squirrels as they discussed the animals behavior and physical characteristics that enable them to survive harsh northern winters. Students recorded their observations in nature journals and warmed themselves with hot apple cider and cookies in the new education center. "It was a marvelous trip!" 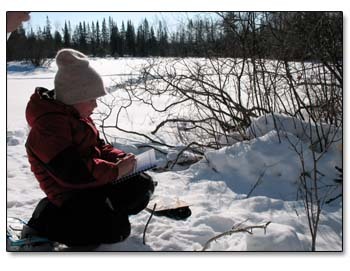 Wrote second grader Caitlin Hartigan, reflecting the sentiments of the students who were delighted to try the sport of snowshoeing and to take their learning outdoors. When Mercer School added its elementary wing in 1991, a unique courtyard was created between the two buildings. Over the years, however, the courtyard became unkempt and underused. This year, with the help of a MEF grant and additional monetary support from the woods and Blooms Garden Club in the form of a $555 donation, the courtyard is being transformed into a beautiful outdoor classroom. Two students, Xanath Guzman and Ross Kessenich, from the Mercer Educational Tourism Charter School, (METCS) became the Project Leaders and were helped by members of the garden club, Iron County Land and Water Conservation Department, PTSA moms and retired individuals from the community. Just a few of the areas added to this space are a raised flower bed, featuring native perennial plants that attract butterflies, a rock garden, and a rain garden, created by the water runoff from the schools roof that features native aquatic plant species. 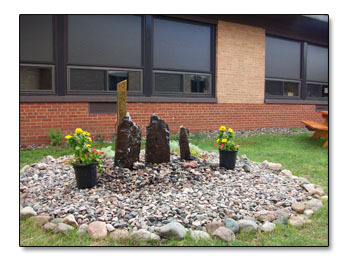 In addition, benches created by the school's tech ed department and a water feature that adds relaxing elements provide teachers with the opportunity to bring their students into an outdoor classroom that is right down the hall. Windows from the cafeteria allow students to view this new area while they enjoy their lunches. Plans are to continue working on the project when weather breaks in the spring. The Mercer Education Foundation awarded the Mercer School District a grant to create a dramatic production during the 2009-2010 school year. Students in the Senior English class, taught by Grant Nelson, and the Mercer Environmental Tourism Charter School, led by Kay Krans, decided to make a movie. The movie was based on S.E. Hinton's book, The Outsiders. The script was adapted from a stage production written by Christopher Sergel. However, McKenna Klein, Ryan Raschke, and Allison Shackelton worked hard to adapt that script into the final dialogue of the movie. 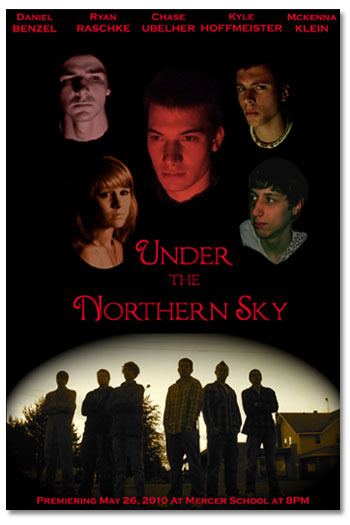 The movie is titled Under the Northern Sky. The senior class chose to make the movie based on The Outsiders because the story mirrors a similar conflict that exists in any small tourist-based community. In The Outsiders, there is a conflict between two groups of different people, and Mercer experiences a similar problem between tourist and local youths. Every year, kids from different towns and backgrounds come into the small town of Mercer and the two groups are forced to interact with each other. The Mercer students wanted a challenge and an opportunity to be creative, and also to learn the many aspects of telling a story through filmmaking. Creating a film is very different from writing a story or telling a story orally. Filmmaking requires you to tell a story visually as well as through a written script. One senior, Danny Benzel, already had a lot of experience working with filming and editing. "Editing such a huge project was very hard. It takes a lot of time to get everyone together between track, work, and other things and it was a huge undertaking. Getting everything in place, everyone's lines, and everyone there was almost impossible. Editing took what seemed like thousands of hours of painstaking work. I hope it turns out in the end." The movie premier was free of charge and opened to the public on May 26, 2010 at 8:00 p.m. in the Mercer School cafeteria. The premier was a resounding success, with an estimated 150 people in attendance. The Iron Nordic Ski program was started in 2008 with the help of a $2000 grant from the Mercer Education Foundation. This Program provides ski lessons, equipment and the opportunity to travel to area ski events for both middle and high school students. in return, its members provide ten hours of community service to the program by assisting with the Stormy Kromer Pursuit, a 2-day cross county ski race held in early January each year, as well as helping brush and groom the trails, and splitting firewood for the warming cabin. The skiers have had the opportunity to participate in the American/Kortelopet, (the largest Nordic Ski race in North America), held in Hayward each February, the 2009 High School State Champions held at Winter Park in Minocqua throughout northern Wisconsin and the U.P. of Michigan. The goal of the Iron Nordic program is to teach the life sport of cross country skiing to the youth of Iron County and to increase their fitness levels with a low impact activity. It's success can easily be measured by the enthusiastic return of it's members year after year. Grants are essential to the success of the cross county ski program as new equipment is expensive and middle school students rapidly out grow gear.